I’m Alive, with so much life to live! I was in a serious car accident a little more than a week ago. It was foggy, and very dark. My car started to slip, and I over corrected. I hit a tree, sliced the tree in half and rolled down a ravine. The tree followed me down the ravine and landed on my car. I don’t remember much after that until the first responders arrived, but there was a moment I remember thinking… “Okay, this is it.” The next thing I knew first responders were yelling, “She’s alive!” I bit my tongue, so there was a significant amount of blood coming from my mouth. They pulled me out of the car, and I knew at that moment…Yes! I am alive with so much life to live!! After dozens of tests, X-rays and scans, we found out I fractured my pelvis in 6 places. I had surgery on my sacrum, which is the large part of the pelvis that fuses to the spine. There is a 6 inch screw through my sacrum, but it’s only going to make my pelvis stronger! The doctor says there are no long term complications involved with this kind of surgery, and even if there is a complication with the screw, they could always remove it and I would still have a strong and stable pelvis. I suffered no brain injuries, no other broken bones, no internal injuries, no spinal, neck or back. I am truly blessed and God has a plan for me. I will spend the next 3 months with Mr. Miyagi. 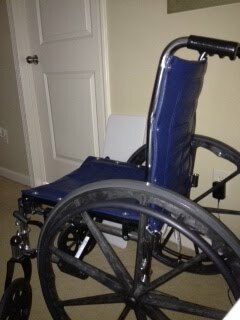 I named the wheelchair that because it is short and will make me stronger. I have to be completely off my feet for 10-12 weeks to ensure proper healing of my pelvis. 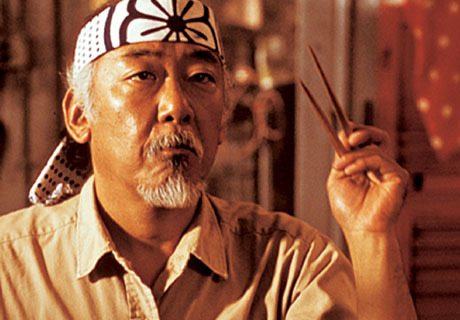 Life with Mr. Miyagi will be exciting and challenging. I’m looking forward to the days ahead. I thank God several times a day for the air in my lungs and the strength to get stronger. Life is a gift. A gift I fully intend on cherishing for many, many years to come. I’ve been enjoying your blog. Much in common. I used to be in news (print). I worked for an Army newspaper (was not in the Army) before having kids. Also, I was in a serious car accident-crushed left side of my face, broken scapula and head trauma. My youngest is 12 now. Loved the post about your dog “Unforgettable). We got a puppy last October. I started blogging at Real Moms Don’t Judge. Stop by if you get a chance.